“Crews removed the statue of Jefferson Davis, the president of the Confederate States of America during the Civil War…under a heavy police presence,” said the photo caption in May 2017 in The New York Times. A later headline declared, “Mississippi School Named for Jefferson Davis to Be Renamed for Barack Obama.” And last Christmas, part of a Times story on removal read, “Members of the Sons of Confederate Veterans were equally upset…But much of Memphis, a city that is 64 percent black, saw the removals as essential…” But were there any happy stories for the 210th birthday of Davis this month? Jefferson Finis Davis was born 3 June 1808 in Fairview, Kentucky, and grew up in Mississippi, son of Samuel Emory Davis, himself the son of Evan Davis “from the region of Snowdonia” in North Wales. Some biographers dismiss his middle name, but others claim that “Finis” was Latin indicating that he was the last, finis, of ten children. As a West Pointer, though, he signed himself Jefferson F. Davis. His Revolutionary War veteran father did name his son after the president in 1808 – Thomas Jefferson. Davis also left his name in the lore of the US Military Academy when he was arrested for the Eggnog Riot, also known as the Christmas Grog Mutiny of 1826. Smuggled whiskey fueled a minor fracas when officers shut down a drunken cadet party. It is not recorded if togas were worn. One sober plebe then, graduating a year after Davis (with no egg on his face, nor any demerits whatever), was Robert E. Lee. At his first army post in Michigan, Davis fell in love with his commander’s daughter. When Colonel Zachary Taylor refused his consent for marriage to a military man, Davis resigned his commission in 1835, married Sarah Taylor, and moved back south to his family. After she died three months later, he turned to his Mississippi plantation and his slaves. Ten years later, he married Varina Banks Howell. At the start of the Mexican-American War in the spring of 1846, Davis, already a US Congressman through a special election, rejoined the army and again served under Taylor, by then a major general. With the war over in 1848, “Old Rough and Ready” Taylor, the hero of Buena Vista, was elected US president. 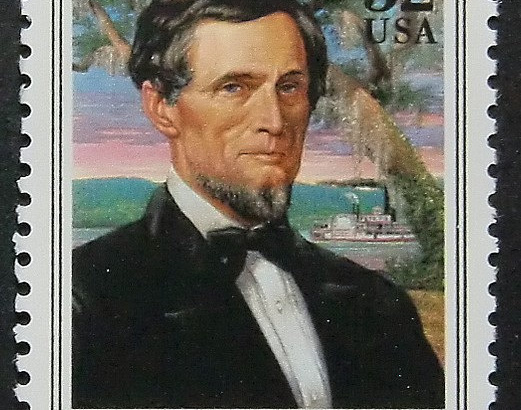 As a war hero himself, Colonel Davis was then appointed to the US Senate from Mississippi. His time in the senate was interrupted twice, once by a term as Secretary of War under President Franklin Pierce, 1853 to 1857, and again when he resigned in January 1861 after Mississippi seceded from the union. That February Davis was elected the first (and only) President of the Confederacy. He made his best political move in 1862, by naming Robert E. Lee to command the Army of Northern Virginia. As the four-year old Confederacy failed in April 1865 and victorious Union troops marched into his capital of Richmond, Virginia, Davis escaped to Georgia, where he was arrested on May 10, wearing his wife’s “waterproof wrap” and “little black shawl” against the morning cold. His boots and spurs gave him away, and for years afterward, Davis was caricatured as fleeing capture wearing his wife’s dress. On the 100th anniversary of Abraham Lincoln’s assassination, “a memorial to the Confederacy” opened in 1965 with the largest bas-relief sculpture in the world. Carved into the side of Stone Mountain in Georgia, Davis rides across the rock on his horse with generals Lee and Thomas “Stonewall” Jackson following – three heroes of the Confederacy who tried to found a nation based on slavery. They failed in person, but, as sculptures, they are honored outside Atlanta in a tribute that would be difficult to remove. As the conflict over monuments and memory continues, Mississippi novelist William Faulkner’s quote comes to mind. “The past is never dead. It’s not even past.” It seems to apply to those who refuse to admit that the Lost Cause of Davis, Lee, and Jackson indeed was lost. It’s odd, but Virginia Republican senatorial candidate Corey Stewart insists the statues must stay. “Nothing is worse than a Yankee telling a Southerner that his monuments don’t matter.” Except Stewart was born and raised in Duluth, Minnesota.